I just hope the good people of central PA have enough Hornady Zombie Max to fend off the hordes of mindless progressives roaming the landscape westward. That is, so open minded their brains fell out. Get it? But, just like Sebastian, I keeed, I keed! Work is dry, home is dry, I got soaring land values because of my beachfront property. Living in at the jersey shore just a hair north of Atlantic City this makes me sad. Being from Plymouth Meeting PA this makes me happy that I can still live by the beach and be in a “Free State”! 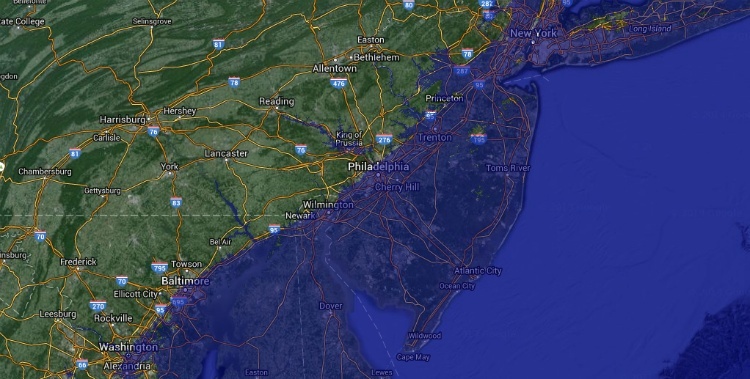 Hmmm, let’s see – All of New Jersey and New York City under water, half of Baltimore, Md. and Washington, D.C. under water, too. If all the ice were to melt, I suspect there would be more serious problems, as the temperature would have to rise over 30 C in Antarctica to melt the southern polar ice cap. This did remind me that a large percentage of the Netherlands is below sea level, according to Wikipedia, 26% is below sea level (probably mean sea level) and 50% less than 1 meter above sea level. I suspect that means that over 50% of the Netherlands could be under water part of the time (around high tide) right now if all the dikes failed. yeah, i don’t know, i imagine no decent people live there. certainly no one that’s pro-gun! But if we disarm our nation with “common sense” gun laws, the ice melting will stop and we will live happily ever after. That IS the problem. Who would want them? Build a sea wall 50 miles inland and make them pay for it? By my calculation, to raise the oceans of the world 33 ft, you would need ice not floating on water now that covers about 330000000 sq. kilometers THREE MILES HIGH. So not even if everybody dumped all the ice out of their freezers would there be enough. The land mass of antartica and Greenland is no more than 50000000 sq km and the ice is NOT THREE MILES THICK! I think the median projection is 3.3 ft by 2100, not 33 ft. The loss of land ice is only part of the problem. Liquid water expands as it gets warmer. The expansion coefficient is small, but the oceans are very large, so a substantial part of sea level rise comes from thermal expansion. The warmist map indicates Baltimore “under water” Baltimore is 33 ft above sea level. I was pointing out that there isn’t enough ice to melt to get that 33 ft. Right, 33 ft is well above the projections for the next century. Maybe whoever made that image misplaced the decimal point. Actually, this is the best reason I’ve seen to support the environmentalists. I don’t want those morons moving any closer to me! Based on that map, I end up living on the beach! I was thinking this was a good thing…then I thought about all the refugee Delawarians washing up on that beach and traipsing across my backyard. I’m gonna have to get more fence! somebody buy the mapmaker a topographical map, please. NJ is not flat, my parents farm is 120 feet above sea level, so they’ll be on a small island. I see one problem: like rats abandoning a sinking ship, the liberals living along the coast will bring their pestilence inland. So, I’d be living a few miles from the beach, and the airport where my plane is would be OK. This is not a problem. Best of all. New Jersey would be gone.